Located one and half hours north of Dallas and two hours south of Oklahoma City. 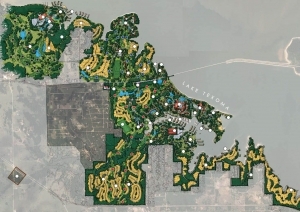 Plan B Holdings, President, Ed Schrank directed the master planning of this 1,236 acre property located on three and a half miles of the northern shore of Lake Texoma. The mixed use property includes two hotels, timeshare, two golf courses, a casino, over one million square feet of retail, an indoor water park and extensive marina. All the commercial development will support the lifestyle of full time and second home residents. Infrastructure financing is provided with Tax Incremental Financing (“TIF”) The property is currently under development with one completed golf course and a functioning marina.